Beginning where the last episode had left off, the drug enforcement team had found packets of drugs hidden inside the broken sculpture, which had been apart of the President’s convoy. Upon discovering the drugs, Diplomat Choi Sung-Hyun looks at Joon-Soo (aka Do-Chan) and clenches his teeth with anger and frustration. Sa Do-Chan and Oh Ha-Ra exchange smiles upon their successful operation, while the attending media covers everything and follows the enforcement team, asking questions about the drug raid. At the office, obviously enjoying his role, Sa Do-Chan begins to talk about the operations success to the media when Ha-Ra quickly stops him from saying anything more. She drags him away from the media. Meantime, Baek Joon-Soo watches the live broadcast of the news in the apartment. He hears about the drug called LSDT, which is latest in the market, and that Diplomat Choi has been arrested and taken to the prosecutor’s office for interrogation. 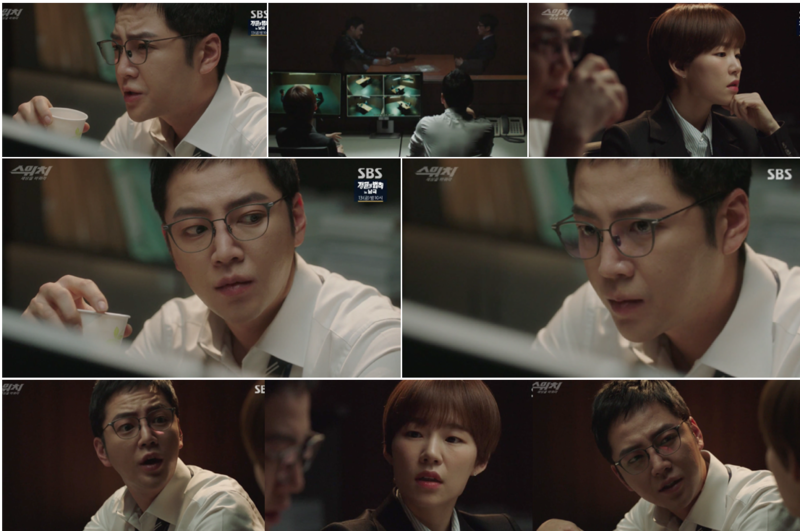 While Ha-Ra and Do-Chan prepare to interview Choi in the interrogation room, Prosecutor Jin Kyung-Hee and Chief Yang watch from behind the one way mirror. Kyung-Hee praises Chief Yang for catching a big fish but advises him to report to her first before doing something like this again. While they talk, Supreme Prosecutor Jung Do-Young charges into the room and scolds them for behaving so recklessly. He reprimands them both for stopping the President’s vehicle just to search for drugs. He warns them to be prepared for the consequences of their actions and leaves the room in anger. At former prime minister Choi Jung-Pil’s house, he and Geum Tae-Woong are having tea while watching the news together. After hearing of the drug raid, Choi scolds Geum and demands an explanation as to what just happened. Geum confesses to Jung-Pil that he never thought the enforcement team would stop the President’s convey to search for drugs. 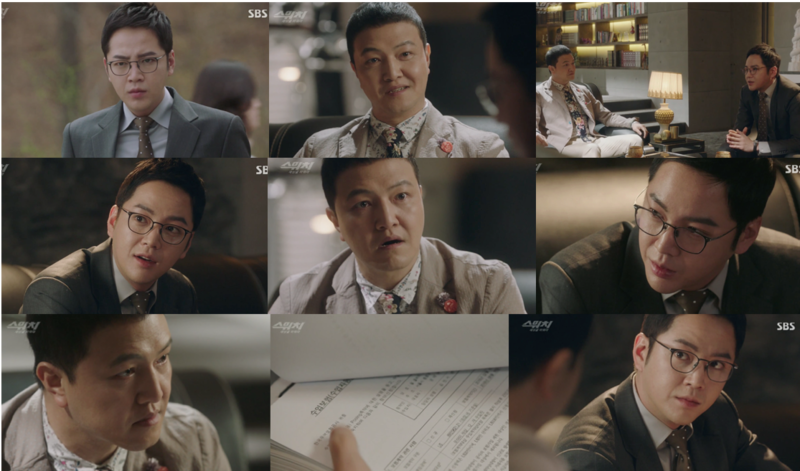 He tells Jung-Pil that Diplomat Choi doesn’t know about the two of them because his communication was with Hwang only. Jung-Pil warns Geum not to be laid back because the prosecutors will trace the funds and once they have search warrants, who knows what they will find or where they will find it. Jung-Pil commands Geum to either go and silence or crush him. Enraged, Geum agrees. Back in the interrogation room, Investigator Go interrogates Diplomat Choi, but it seems Choi has no intention of answering the questions. As he uses his right to remain silent, he sits back and relaxes. Meanwhile Sa Do-Chan monitors the interview through the one way mirror. Ha-Ra enters the room with coffee for both of them and asks whether there is any improvement in the interrogation. Sa Do-Chan informs Ha-Ra that Choi has kept his mouth shut for almost six hours. Ha-Ra takes this moment to probe Do-Chan about how he knew that the drug packets were inside the statue. Do-Chan tries to convince her that it was his intuition because he works in the special field. However, Ha-Ra is not prepared to let Do-Chan get off that easily and continues with more questions. Avoiding any straight answers, Do-Chan insists that Ha-Ra should be grateful that he saved her from getting fired. Recalling the broken pottery he saw at Feel gallery, Do-Chan pays Geum a visit. Geum congratulates Do-Chan on his successful drug raid. Rather than basking in his own glory, Do-Chan congratulates Geum instead. Because of Geum’s Gallery, Do-Chan learned about the Moai statues from Easter Island. Coincidentally, a Moai statue was transported in the President’s convoy. Do-Chan thought that sculpture, too, could be hollow inside, just like the broken one he saw being taken away at the Gallery. He took a gamble and smashed it with a crowbar and voila! Reaffirming that his idea was from Geum’s art gallery, Do-Chan hints that he thinks Geum is involved in the drug mafia, which stuns Geum for a moment. Geum provides Do-Chan with all of the relevant invoices, insurance details, and legal papers since the art works are so fragile and could easily damage on transit. Geum pretends he is straight forward and innocent. Back at prosecutors office, supreme Prosecutor Jung Do-Young converses with his superior, suggesting appropriate discipline for Baek and Oh. He presents his proposition for their misconduct. Meanwhile Do-Chan and Ha-Ra wait in their office, feeling desperate. They believe Prosecutor Jung Do-Young is being too hard, despite the fact they know they must be punished. Ha-Ra worries so much about her possible suspension or worse - termination - while Do-Chan tries to calm her down with a joke. Chief Yang enters to the room, looking downcast. With his usual emotional theatrics, Yang announces that instead of them being punished, the prosecutor general has instructed that they form a special task force to investigate this drug case. The problem, however, is the team is to be led by Baek Joon-Soo. All three, looking at each other in stunned shock, express their doubt that they can pull off this switch. Even the president has given his word that he will co-operate with the task force. He declares that every single person found to be associated with this drug will be punished by law, regardless of their position. On the way back home, Ha-Ra escorts Baek’s doctor to attend to Baek. She asks the doctor why Joon-Soo isn’t getting better and pleads with him to make Joon-Soo better soon, since time is running out. In Joon-Soo’s room, the doctor examines Joon-Soo. The doctor discusses with Joon-Soo that his heart is not well and will stop beating soon. He advises that Joon-Soo needs to tell his friends soon. Poor Joon-Soo seems seriously ill, and he needs to prepare how to disclose the bad news to his colleagues. He begs the doctor not to reveal anything, especially to Ha-Ra until he is ready. As soon as the doctor leaves, Do-Chan and Ha-Ra fill Joon-Soo in about the new task force. Ha-Ra expresses her concern that Do-Chan has to really do actual prosecutor duties and that he will be in the limelight. Do-Chan boasts that he is used to being in the limelight, however he knows it is dangerous and the risk of getting caught has increased. Surprising the other two, Baek Joon-Soo says that he believes that Do-Chan is more than capable of executing the work they need to do and gives the green light to go forward. The next morning at the Prosecutors building, the new ‘Diplomat Bag Narcotics Team’ moves into their new office, under the leadership of Do-Chan. Also joining their team is the senior problem-maker prosecutor, Gil Dae-Ro, who has orders to spy on them and report to supreme Prosecutor Jung Do-Young. Other team members appear to dislike Gil but remain silent since he is their senior. Baek Joon-Soo, aka Sa Do-Chan, enters the room and immediately gets on with the discussion of the case. Their goal is to discover the organization behind Choi Sang-Hyun. If they can find the organization, they can find its leader, Grizzly. Do Chan hands instructions to every team member on what they need to do. Under his command, they start investigating the case by looking at Choi's entry into the country, bank transactions, paper trails, seeking co-operation with the Financial Intelligence Unit, and assistance from FinCEN. This later task he specifically gives to Gil, who has no idea what FinCEN is. According to Do-Chan, it’s a US agency that collects and analyses financial transactions co-operation. In detail, Do-Chan continues with an impressive introduction into the connections FinCEN can give them. Unbeknown to the team, Do-Chan is wearing an earpiece, allowing the real Baek Joon-Soo to dictate word for word everything Do-Chan needs to say. Everyone rushes off to complete their assigned tasks. One team searches Choi Sang-Hyun’s house and seizes his belongings, while another team searches the diplomat’s office. They return back to the prosecutors office with the seized files. While Do-Chan is handed a document, a female colleague announces she is speaking online with the Embassy of Columbia. Oh Ha-Ra takes over and the Ambassador informs her that Choi was planning to immigrate to the Bahamas. Investigator Go barges into the room, interrupting Ha-Ra informing Do-Chan that FinCEN discovered a secret account set up in the Bahamas, in Choi’s name. When word reaches of the team's activities, Geum commands Manager Kim to notify Hwang to stop the production and sales of the drugs, and to ensure no one goes out on their own to sell the drugs. Geum meets with Jung-Pil and informs him of the prosecutors' progress. Geum admits that despite setting up numerous decoys for Baek to follow, he has caught up quickly. They worry that if they get caught, the fallout will be much higher than anticipated. They decide to put everything on Diplomat Choi. Let him take the blame and manipulate the media. During this time Old Man Bbeong has just been informed that the prosecutors have uncovered the account in the Bahamas. He is pleasantly surprised at Baek’s progress and tells himself that he will end up competing with him and that he must hurry. Back at the office, Gil Dae-Ro sits and talks unnecessarily, oblivious to his tasks. He asks Ha-Ra where she got her unique necklace, the scales that belong to Lady Justice. As Ha-Ra reflects on how she obtained the necklace, she tells Gil she took it. In his annoyingly supercilious tone, Gil prattles on about how many gold carats it is. At the end of the day, Ha-Ra arrives at Do-Chan’s apartment and enters Joon-Soo’s room. As she collapses into the chair, she tells Joon-Soo about the progress of the investigation. They are currently following the paper trail, discovering borrowed account after borrowed account. So many that it is hard to find the original. Upon Joon-Soo’s inquiry on Sa Do-Chan, Ha-Ra tells Joon-Soo that they discuss what strategy they have to carry out; she signs the documents; and that everything is going well. Regardless of the investigation, Joon-Soo reminds Ha-Ra once more that they must confess and pay for their crimes once this case is completed. Ha-Ra agrees as long as they catch the criminals first! Attending to their beauty care, Ha-Ra’s mother and sister chatter about Ha-Ra’s relationship with Baek Joon-Soo. Ha-Ra's mother still hopes to end her daughter's affection for Joon-Soo. Meanwhile, Jo Sung-Doo and his gang are frustrated. Even though they have been given orders not to sell the drugs, they are tempted to rid themselves of what they have left. They decide to sell them in small amounts so not to arouse suspicion. No sooner do they enter a building to sell the drugs but they run out again, being chased by the police. Unfortunately, they were also trying to sell in another dealer's territory. Both Geum and Do-Chan’s team hear the news, surprised someone would be so stupid to try and sell while the team are investigating. Supreme Prosecutor Jung Do-Young calls and warns Geum to be careful during this dangerous time, or else he won’t be able to help. An angry Geum allows Hwang, the dealer whose territory Jo had dared to sell drugs into, to deliver whatever punishment he wishes. Despite Jo’s pleas and apology, Hwang tortures Jo until he is virtually unconscious. Jo, then, is moved to a locked room. While driving home, Ha-Ra and Joon-Soo chat via car phone. Joon-Soo shares his doubts about DoChan’s motives. Ha-Ra tells Joon-Soo that she will kill Do-Chan if he tries to con them again. Joon-Soo tells her that he wants to know Do-Chan's real target. The next day, Prosecutor Jung Do-Young, Geum Tae-Woong and Choi Jung-Pil meet at an archery club. Jung-Pil advices Do-Young that ‘hunters must catch big prey in order to grow.' As Do-Young prepares to fire his arrow, Jung-Pil invites him to join his Namsan Club. The episode ends with the three men going their seperate ways, strong determination on Do-Young’s face as he leaves from the archery club.